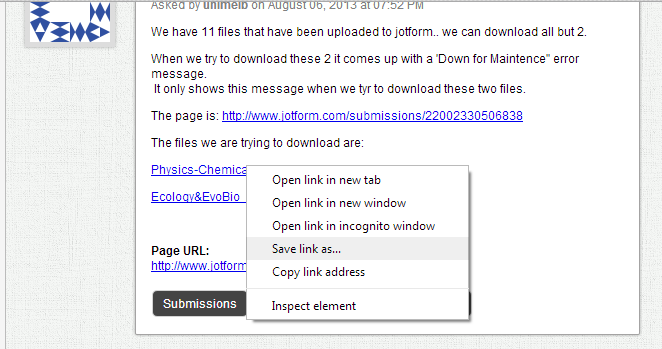 We have 11 files that have been uploaded to jotform.. we can download all but 2. When we try to download these 2 it comes up with a 'Down for Maintence" error message. It only shows this message when we tyr to download these two files. I'm able to download those files properly (by right clicking the link and selecting Save link as, maybe try resetting your browser's cache or trying a different browser and try again. Like Cesar, I am able to download the provided PDF files here. It might be a temporary server issue, you can try again this time. The provided workaround above should also help. Let us know if you still have difficulties downloading these files. Thanks! I have tried to download from FireFox, I.E and Chrome... I have the same download error with all 3 browsers. I have downloaded the files for you. I have no clue why you are unable to download it form your end, maybe the files wasn't yet migrated on the servers where your forms belong to I'm not sure though. Have also you tried clearing your browsers cache before re-downloadnig the files? This might help. Thanks for the files... I have cleared the cache and history etc.. bu same result. I have just tried again now... same result- can;t download. Thanks. Is there any error that shows after you click the file links? Have you tried it with different browsers? If the problem still persist, try it with the following URL. Hope this works for you. Anyway, in case you need assistance in downloading your files, feel free to contact us here. There is no error, but I have fodun a work around... thanks to me - I originally setup the files to go to Dropbox. I had forgotton about this but I will now just download direct from Dropbox. We are glad that you found a workaround. You're awesome. We will note what you have done so that we could apply it to others that will have the same issue. If you need any further assistance, please don't hesitate to let us know.